Creating complementary main characters is a skill which, if mastered, can lead to great fiction. 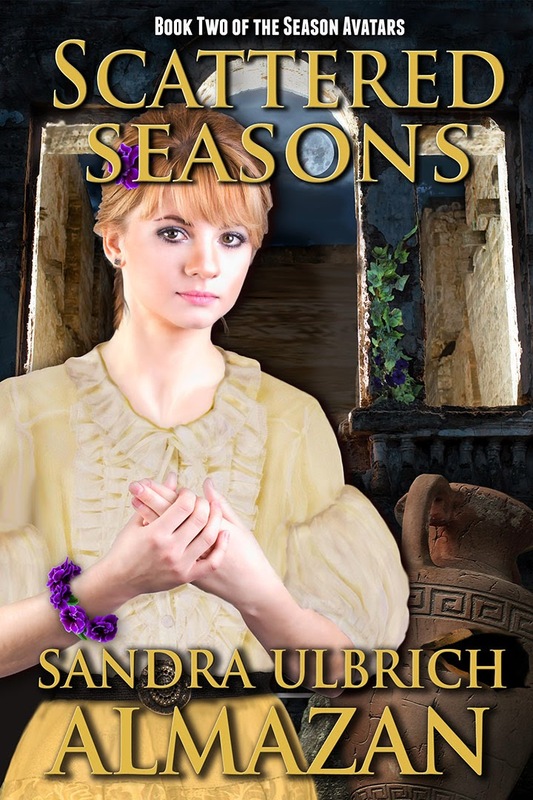 Today Sandra Ulbrich Almazan explains how she developed the women in her new novel, Scattered Seasons. It happened nearly twenty years ago, while I was reading Mark Hertsgaard’s A Day in the Life: The Music and Artistry of the Beatles. I read a description of the Beatles’ four-fold synergy and thought I’d like to write a story about a quartet working together to create literal magic. From that idea, I slowly came up with a group of four women who each had a type of magic associated with a different season. They were originally called Season Lords, but I changed their name to Season Avatars for a gender-neutral term. While the magic concept was important, even more important was creating a group of characters with different but complementary personalities. There are different tropes for doing this, such as the Four Element Ensemble, the Four Temperament Ensemble, or even using blood types. (Warning: all these links lead to the fun but time-sucking TV Tropes website.) I chose a simpler method, which I’ll refer to as “Brain-Body-Heart-Soul.” This was also inspired by a description of the Beatles. (Fans may disagree on who played what role within the group. I see John as the brain, Paul as the body, George as the soul, and Ringo as the heart.) Each of the four Season Avatars plays one of these roles within the group. Jenna is the Summer Avatar and has plant magic. She’s the most sensual of the quartet (so she’s the “body”) and frequently has to remind Gwen to have fun and not focus constantly on her duties. Ysabel, the Fall Avatar, has animal magic. As the heart of the group, she’s friendly and warm. She’s a diplomat who wants everyone to get along and will mediate when the others argue among themselves. Gwen and Jenna tend to argue a lot, so sometimes they need a go-between. Finally, Kay, the Winter Avatar with weather magic, is the soul of the group. Although all of the Avatars originally obtained their magic from the God or Goddess associated with their season, she is the most pious and the least likely to question her God’s will. Of course, it wouldn’t be satisfying to make each character one-dimensional, a person fit only for a certain role and no more. Each of the Avatars comes from a different type of family and a different background. Some of them have talents in non-magical areas, such as music, drawing, or sewing. They all have different personal challenges to overcome as they learn to work together. Each of them will get her own book, starting with Gwen in Scattered Seasons, to tell her part of the overall story. I look forward to introducing them to you. Learn more about Sandra Ulbrich Almazan on her blog or on Facebook. Purchase Scattered Seasons on Amazon and Barnes & Noble. For me, writing fiction is all about the characters. And when I create a protagonist I enjoy, I can't help but write more stories for him. When I came up with Captain Bartholomew Quasar back in the spring of 2010, I was going for a mash-up between William Shatner's James T. Kirk and Dudley Do-Right from the Rocky and Bullwinkle Show (but in Quasar's case, things seldom ever go right). He's one of those classic pulp heroes with a heart of gold whose narcissistic tendencies often land him in hot water. The captain hasn't changed a whole lot in the dozen other tales I've written, but his relationship with Hank and the other characters is deepening with every story, as Quasar realizes he needs them in order to continue being as awesome as (he thinks) he is. I don't write hard science fiction with a whole lot of actual science in it. I focus on the characters, and everything else I just make up—or I rely on osmosis to filter enough jargon into my brain from all the SciFi that I've read. I do my best to aim for universal themes and relatable characters, and I try to shoot for a high entertainment value that transcends any barriers to enjoying these space opera tales. I hope readers can laugh at Bartholomew Quasar and root for him at the same time. He's ridiculous, but there's something about his fallible nature that most of us can relate to on some level. 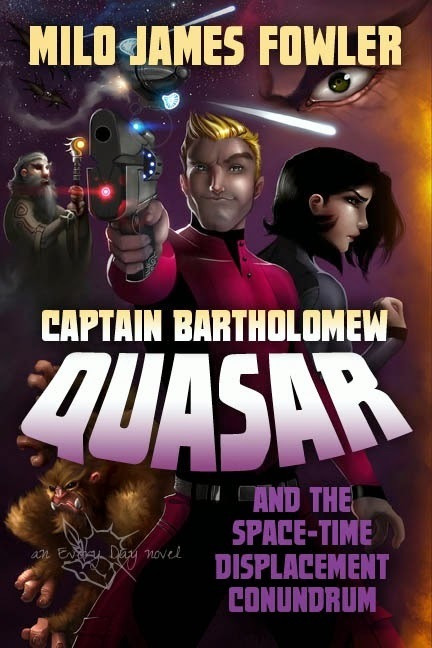 My debut novel Captain Bartholomew Quasar and the Space-Time Displacement Conundrum started serialization on April 20. Torn from the present to relive his past, he vows to keep mistakes from occurring the second time around. But is he doomed to repeat the past? Or can he erase his regrets? Join the crew of the Effervescent Magnitude for a hilarious time-travel space adventure the likes of which you've never seen. Read more about the series and subscribe to it here and read the teaser/prologue right here. No, I don't believe that computers make us more creative. In fact, I tend to agree with Annie Proulx who, like me, writes all her first drafts by hand. She's made statements to the effect that typing your words the first time through makes you think less carefully because the process becomes "facile." Income opportunities. I have picked up two regular freelance jobs (one as a website fact-checker and one as a social media manager) from writing colleagues because of tech skills I've acquired. This, in turn, helps me remain a freelancer rather than going back to the traditional working world. Promo opportunities. If you can run a blog, keep a website updated, and post regularly to social media, you certainly have a leg up the steep slope of Mount Marketing. These days, I'm amazed when writers don't have an active, organized Web presence. Not that I don't still have a ton to learn! Ease of editing. For some, it's novel-writing software like Scrivener that makes the difference, but even getting to know the ins and outs of Microsoft Word can change the editing and revising stages for a writer. And now there's Word for iPad, and a dedicate cloud service called OneDrive that gives you editorial access to all your documents on all your devices. Yay! Ease of submitting. Duotrope. Submission Grinder. Submittable. Query Tracker. Google Drive spreadsheets. There are many ways now to keep really detailed, sophisticated records of what we've submitted, to whom, and when. And often, we can find out how long to expect responses to take (based on real user data, not just what the magazine editor says). I always have at least twenty pieces out looking for homes, so programs like these truly help me stay sane. Your turn: How does the digital world color your writing life?